Hello everyone, and wow is the word for the day. We had a slow morning, very little sign, but after lunch, things changed for the better. Not only did we have excellent weather, the fishing was just a good. 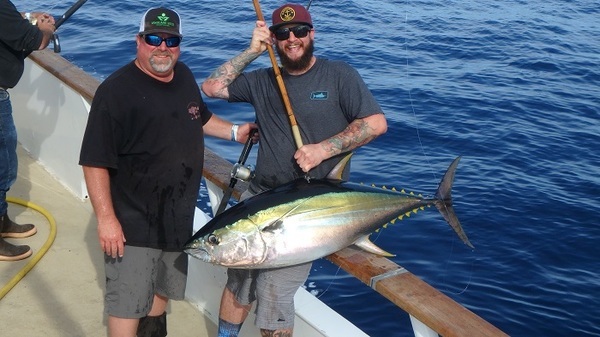 We had a day of 50 plus Yellowfin tuna. 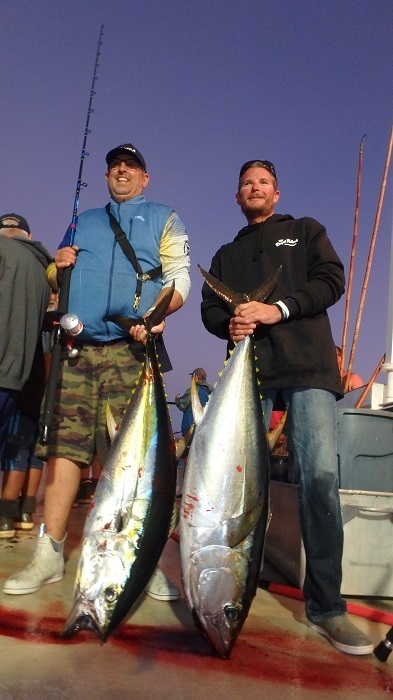 Most of the tuna were in the 70 to 110-pound grade, except for one stand out. The stand out fish was caught by Don Burnside. We estimated Don’s fish to be around 160+ pounds. With the bite hot and heavy, no time to weigh it. With 4 to 7 fish going until the sunset, and everyone aboard is looking forward to a hot shower and some sleep time. We will try to make a tank of bait tonight, and give it a go tomorrow. Hopefully the Yellowfin will continue to make their showing, so until then good luck and good fishing.